Donating your unwanted clothes and household items to an Atlanta charitable organization is a good way to give back to your community. When you donate your old items to American Kidney Services, the funds those items generate go toward organizations, like the American Kidney Fund, whose work alleviates the financial strain of kidney disease patients who are struggling to pay their bills and for expensive medical treatments like dialysis. Because we at American Kidney Services know not everyone has time or the means to take their items to our storefront location, we have made our drop boxes very accessible. There are hundreds of drop box locations in the Atlanta area, and donations can be taken to Value Village locations, as well. But to make it even easier for those who wish to donate, we also offer curbside pick-up of your items. Simply call us or fill out the online form to have one of our courteous uniformed drivers take your items when your home is next on our pick-up route. 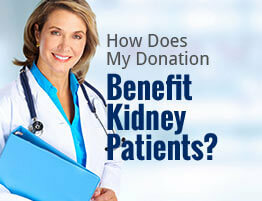 You help people suffering from kidney disease receive a little financial help through a difficult time. This help is often what allows them to pay for their life-sustaining dialysis. You can de-clutter your home. Removing old clothes and household objects you aren’t using can free up a lot of space and give your home a more relaxing atmosphere. Donating items, rather than throwing them away, helps the environment. It saves space in landfills, and if your items are reused by someone else, it also reduces the need for new items to be produced. Donating your old things allows families to buy much-needed items at more affordable prices so they don’t have to go without. Your donations are tax deductible. * We can provide you a tax receipt. Donating feels good. It’s an easy way to make a big difference in others’ lives. To learn more about donating to our Atlanta charitable organization, contact us today.